1 - I am drawn to things bright, bold, outrageous! And, apparently they are also drawn to me!! 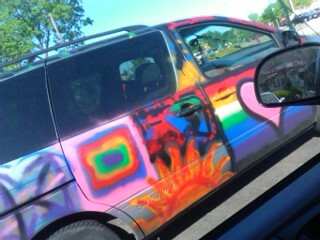 I keep finding the Marathon Mommy Minivan and I surrounded by bright, bold, and outrageous vehicles. Yes, that is a leopard print vehicle, with shag carpet bumper! 2 - I had a goal of running 180-200 miles for the month of May. With my marathon planned at the end of the month, I thought that would be easy peasy. Well, with my event mileage being cut in half last weekend and only two missed workouts, I ended up logging 155 miles this month. That is double what I did the months prior. Yeah, me! That, in combination with eating well and being pretty disciplined, I have been able to drop quite a few pounds, inches and a pants size or two! 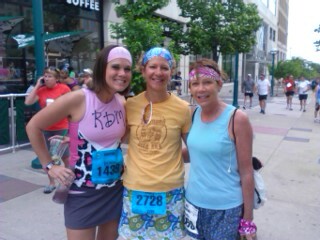 3 - It was so much fun running into RDM readers at last week's half marathon in Madison!! If you are going to be any of the events on my 2012 race calender, drop me a line. I would love to see you! In case you haven’t heard, the Madison Marathon (HERE) was canceled last weekend, due to high temperatures predicted (around 95 degrees). All of the full marathoners, like myself, were automatically placed in the half marathon. I believe there were about 3,000 already registered for the half marathon and about 1,500 for the half. There ended being a total of 4,390 runners that finished the half marathon this past Sunday. There was a lot of controversy leading up the race, because people were upset that the race was cancelled. I was very upset that I wouldn’t be running the 26.2 mile event but totally understood why organizers cancelled the full marathon. I was just going to try and make the best of it. I had a Milwaukee-area blogger staying with me on Saturday night, who is also one of my Ragnar teammates, Amy from Running is Cheaper Than Therapy (HERE). I picked up our packets at the expo at the Monona Terrace Convention Center on Saturday afternoon, before heading over to Brat Fest with my family. Packet pick up was extremely organized and efficient. We browsed the expo, ran into some peeps that recognized me from RDM (sorry, I forgot your names, but thanks for saying “hi!”), and purchased a few new Bondi Bands. The technical tees were adorable and one of my favorites!! Amy and I went on a nice walk Saturday evening, looked at the forecast for Sunday one more time, and headed to bed shortly after 9:00 p.m.
We woke up at 5:00 a.m., got on our race gear, ate breakfast, and left the house shortly after 5:45. We parked quickly at the Monona Terrace. Then met up with another local blogger and Ragnar teammate, Linda from Mom Running from Cancer (HERE), outside of Starbuck’s. 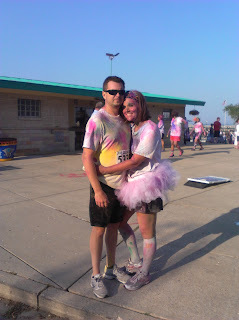 We chatted and took some cute pictures, before running some things back to the car. It was surprisingly not warm. After all the debate all week about the weather, we actually felt extremely comfortable. I ran into a RDM reader, Sue. We exchanged hugs and wished each other luck. Then the gals and I ydrated a bit and then went to the loooong restroom line, where a sweet gal approached me. 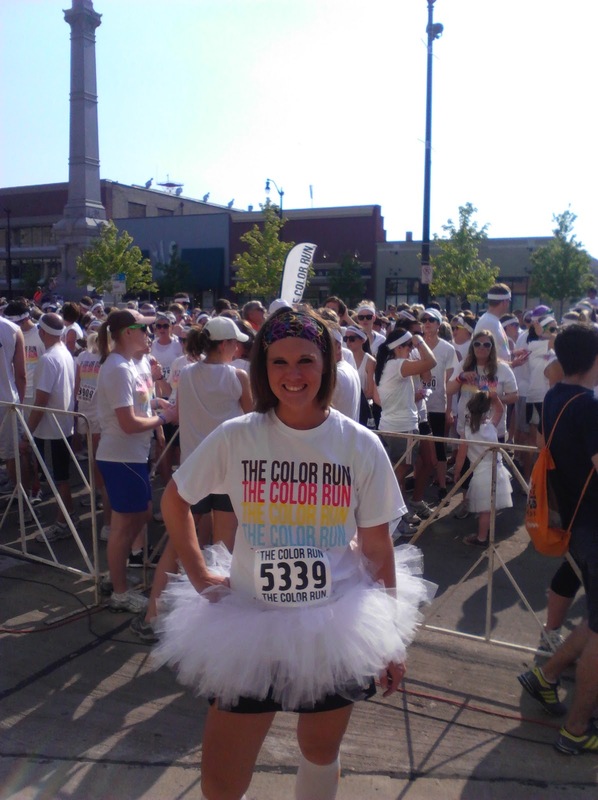 She reads RDM and was running her first half marathon (CONGRATS – I hope that you had a great experience!). We finally made our way through the potty line, I ran into my friend Jason, and then headed to the start line, just in time for the National Anthem. We split up in the sea of people and the race started. Amy and I zig-zagged for a good 2-3 minutes. 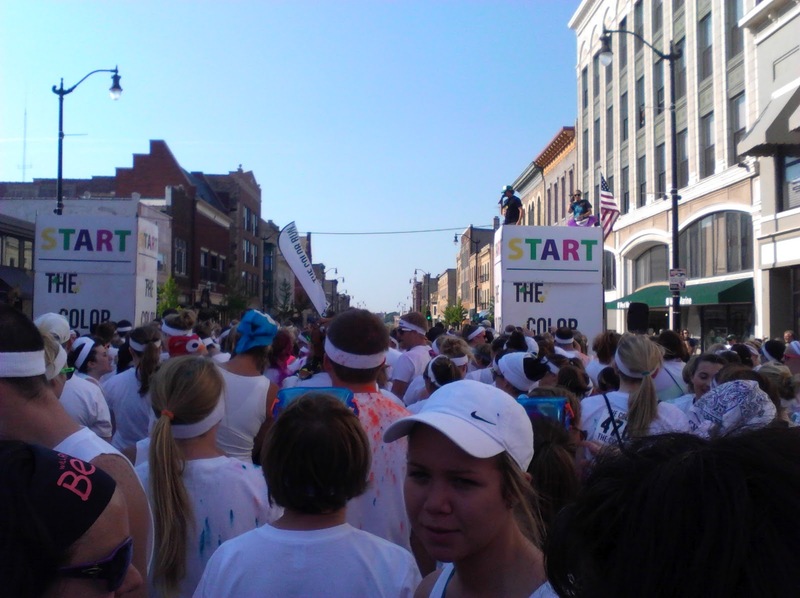 The start area was clogged with runners … and walkers (walkers??). 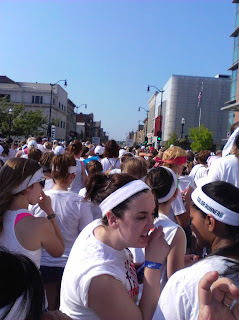 After about a mile, I felt like I wasn’t constantly dodging people, though it was still extremely crowded. During the first mile, I heard Jenny, a RDM reader, say “hi” as she flew past me. We were going to be meeting up after the race. I was glad she said hello, so that I could recognize her later and wish her well on her race. I was getting into a nice groove and constantly sipping on water from my handheld bottle. The first water station is the only one that I skipped. Shortly after I got into my groove, I heard someone behind me say my name. It was Julia, another RDM reader. She lifted my spirits and we wished each other luck as we ran on. We ran through downtown Madison and headed on some rolling hills towards Tenney Park. At the 5K mark, I was at 27:53. The crowd support was FANTASTIC and the water stations were long, but extremely crowded. There were people stopping to walk everywhere and hydrate. Everyone was being safe, due to the temperatures. However, it made the stations over-crowded and difficult to navigate. Speaking of hydrating, a friend Stephanie and her pals were hand out beer along this point. I passed it up. I ended up seeing J and the munchkins at Tenney Park, which I wasn’t planning on. I think they were surprised to see me, too. Because they would’ve missed me, if I hadn’t called out to them. Here, I also saw a great sign with a mask of Bill Clinton, “Keep going….Don’t pull out ….That’s what She Said”. There were lots of us chuckling. I checked out my pace and was going slower than 9 minute miles. Quite a bit slower than my usual pace, but I was doing ok with it. I wasn’t going to try and race the clock with the heat. We headed down towards Maple Bluff, where I saw a friend, Lauren, cheering on from the sidelines. I was starting to get warm and she kept me going. We headed past the Governor’s mansion where some runners were snickering and making comments. I passed up the energy gel station and took one of my own. At the 10K mark, I had sped up and was at 56 minutes. I was happy and moving along at a comfortable pace. I continued to dump two cups of water into my handheld at every water station. 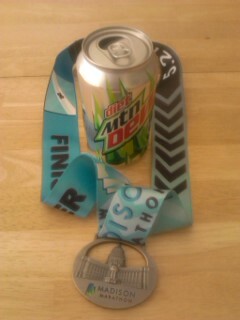 I had never consumed so much water during a race. I took on Gatorade and that was it. I hate lemon lime and that’s all they were offering. I saw my family again at the other side of Tenney Park. I was so happy to see them (Can you tell?)!! At the 15K point, I was at 1:24:42 and knew that I was going to really have to push it to make sub two hours. The whole race had been cloud covered until this point and it was surprising not incredibly warm. Although, I wouldn’t exactly call it cool. I could feel the salt hardening on my face. We headed towards Monona Terrace, where there was tons of crowd support as we headed underneath the structure. It was very cool and reminded me of running under the bridge at Chicago Marathon. We came out of the tunnel and the sun came out too. Now, it was warm. It was bright with a welcomed breeze, as we headed out along the lake. I was sweating like mad and my pace was slowing down. 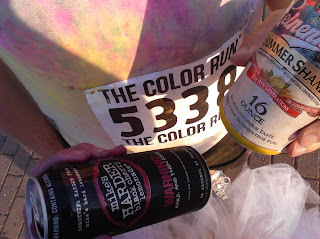 I continued to hydrate through cluttered water stations, though they were well organized and the volunteers were awesome. The course was an out and back along John Nolen Drive and it was fun watching the other runners heading back towards the capitol square. Though it made me wish that I was a mile ahead ... with them. Amy and I greeted eachother in passing. I also saw my friend, Dwight, pacing the two hour group. I never did catch up to them, because I started so far in the back of the crowd at the start line. At mile 11.1 I was at 1:41:39 and I knew that I was barely going to make two hours. Push it or be comfortable?!?!? Get a slightly faster time or risk feeling nauseous and yacking all over the finish line?!?!? I made the turnaround and the sweaty salt got in my eyes. I was sweating a ton. I tried cleaning my eyes with my shirt, but it too was covered in sweat. It only made my eyes burn worse. I ran for a mile and a half with one I open and one I closed. Trying to make my eyes tear up and clear them out. Eventually it happened. But, only after being miserable. I took water at the last aid station and heard my name from my friend Dan at the Berkeley Running Company water station. That gave me encouragement for that last trek up the West Washington Avenue hill. Dreading it. I actually passed a lot of people going up the hill and saw my friend, George near the top. He yelled “The Diva’s in the house”. I smiled and increased my speed as I got to the top. I made a turn around the Capitol Square and passed everyone in sight. I wish I had only had this urge a few minutes back, and I could have broke two hours. A friend, Toby, said he was ready to take my picture, but couldn’t because I was running so fast at the finish. I’m sure he was exaggerating, but I definitely felt good with that last kick. I ended up finishing in just over 2 hours. I got my marathon finishers medal, which I kind of feel silly about. It will hang separately, with my other 13.1 event medals. I ran into my friend Sara and her kids, as well as J and my kids after getting some goodies and chocolate milk. We met up with Amy and her family, then Linda. 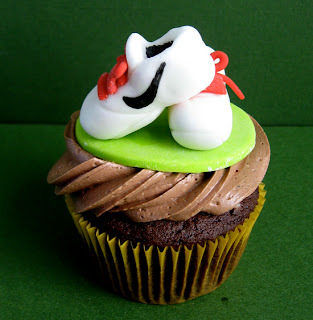 After reconnecting, we headed down State Street to Madison Sweets for a cupcake with Jenny, who I had run into onthe course. The coconut cream cupcake was amazing and well-deserved!! 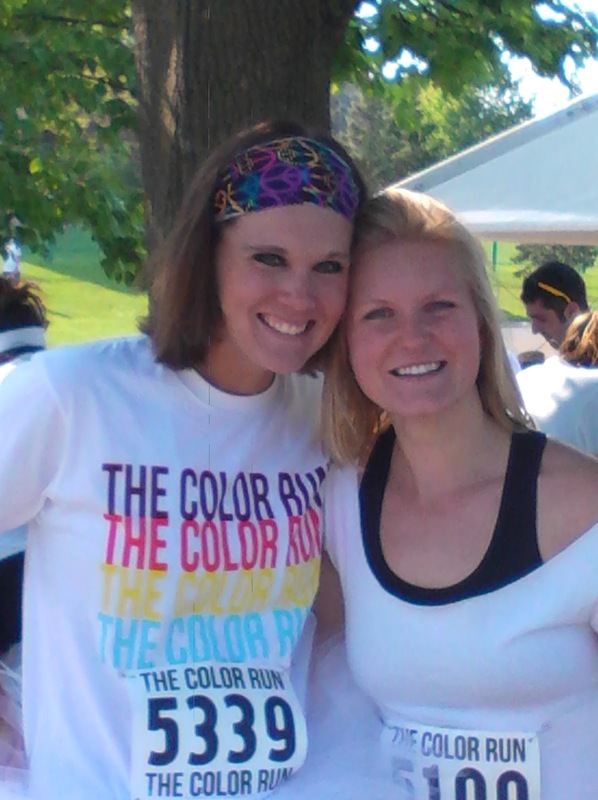 In case you didnt' know ... Couch to 5K runners are fabulous! This group ran their first 5K last November and eagerly waited all winter to start training for a 10K this spring. We started our 10K training sessions with a thirty minute baseline. Now, they are currently training for one hour. Yes, running consecutively for one hour!! They amaze me every single week. Their race is scheduled for the end of June. But, we wanted to see where they are at with pace and endurance. So, we scheduled a practice 10K session last Saturday. The weather was hot and humid (of course)! They were equipped with handheld water bottles, but we ran out of water by the end of the training run. Kind of scary in such heat. But, they were smart. They paced themselves and walked when they need to. And, you know what?!?! They all finished. It's amazing how they all support eachother and keep eachother motivated. There was about a 45 minute difference from the first runner to the last. And, they all stuck around. They came back out on the path to finish the last bit of her journey with her. 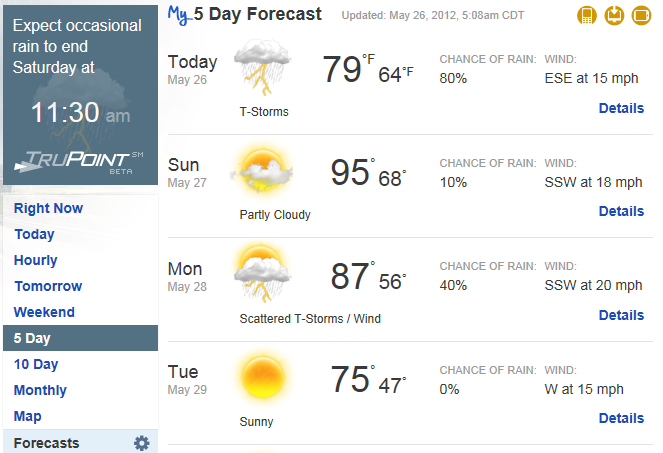 When I looked at the forecast for Sunday a week ago, I was a little concerned that it said 89 degrees. Holy crap. 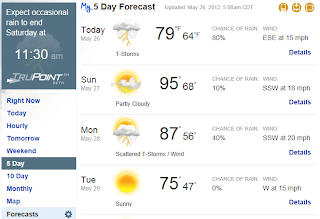 Over the week, the temperature in the forecast rose and rose to 91, then 93 degrees. Runners received an email from the Madison Marathon race directors that there was high possibility that the full marathon event would be cancelled. Runners like myself sat on pins and needles all week, wondering what was in store for us in a few days. Was all our training for a hot and humid full marathon or did we do all of this training for a very expensive half marathon. 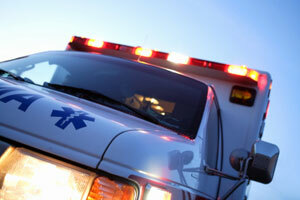 I believe that race organizers were quite concerned, due to the very hot Boston Marathon this year and the Green Bay Marathon that was ended last week, due to similar (but not nearly as not) conditions, where they reported local hospitals being full after twenty or so runners were sent to the hospital. I ran in Madison Marathon (the full) in 2010 when temperatures rose quickly and a lot of runners were rushed to the hospital or pulled of the course. Officials stopped the race clock that year, but allowed us to finish and receive our medals. I finished 4:27 that year. Runners received notice yesterday afternoon that the full marathon is indeed cancelled. You can read the full report on the Madison Marathon webite (HERE). All full marathon participants are automatically entered into the half marathon event. You will also receive a $20 credit towards the 2013 event (regardless if you decide to run the event or not). The course will be open until 11:30 AM, thereby increasing the pace from 14 to 18.5 minute miles. The Wisconsin State Journal reports (HERE) that race directors believe that only 1% of marathoners would actually be able to complete the 26.2 mile event. I have come to terms with the fact that all of my training has happened, with only an expensive 13.1 mile event at the end. I have a few HOT 20 milers under my belt. I was extremely dedicated, with a difficult personal schedule. Had some great runs with friends. Some much-needed quiet moments by myself with my ipod. I've been hydrating all week, trading out my high heels for flip flops at work, embraced the taper and watched my mileage this past week. I've had the marathon experience, without the marathon. Plain and simple. I've done it before. And, I will do it again. People keep telling me, there's always another marathon. Afterall, I'm signed up for two consecutive full marathons in October. 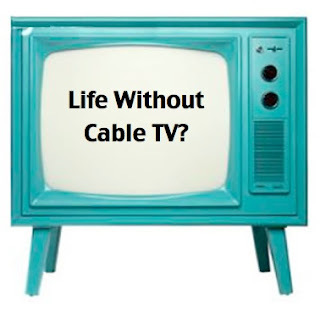 I use to LIVE by cable tv. I had all of my reality tv programs that I needed to watch weekly. I DVR'd them and would watch them in my free time. It was a necessity. When I initially moved into a place of my own, we had limited cable television. The kids had a few channels to keep them entertained. Over the colder, winter months my package ended. I decided to upgrade to extended basic cable. I never watched it. The kids watched the same programs that they watch over at their dads and enjoyed it. But, still they rarely watched it. I am never home and can literally count on one hand the number of times I've watched television when the kids aren't at home. 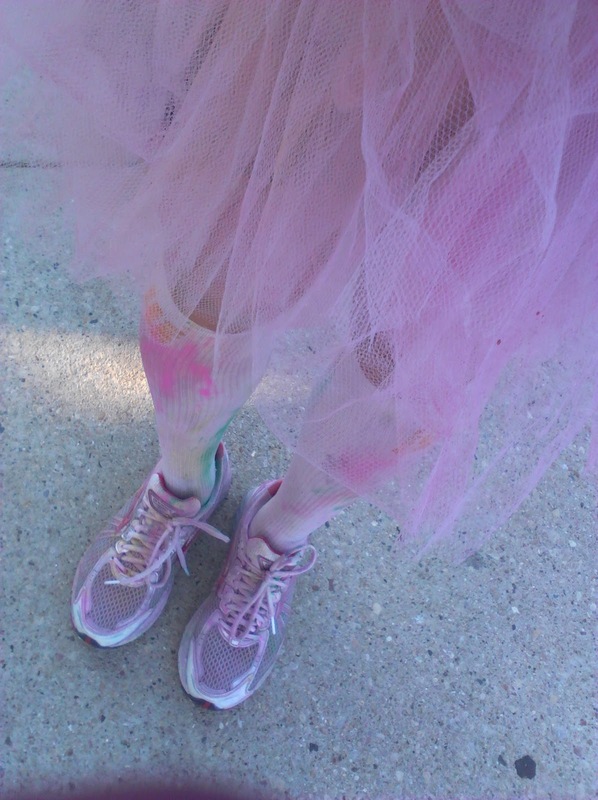 I'm either running, coaching, running errands, cleaning, blogging ... or fifty million other things on my to do list. It was a moment recently, when the kids were not at my house for a few days. I turned the tv on, and it was still on the same channel from 3-4 days ago. Amazing. 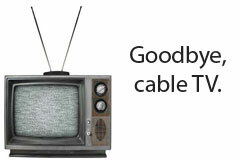 I ended up cancelling cable tv and saving $45/month. Even more amazing. And, I'm loving it. It's interesting. I'm noticing less distractions. Less whining. More "listening ears". I only have to tell them to do something once (ok, maybe twice) to do something. They aren't looking at the tv while "listening to me". An increased interest in reading from both kids (who already loved to read). Less resistance to leave the house or go outside. They are more cooperative. The house is more quiet. They are more engaged and interested in sharing what happened during their day at school. Don't get me wrong .... ﻿Friday nights still consist of much of what they use to. Free videos from the library or $1 movie rentals from the Redbox. We just don't need the regular programming. Apparently, my Facebook post recently, has also prompted other families to do the same. Aweseome. from Madison to Chicago next month. with your name, email and mailing address. And, I will get you your prize! I was recently given the opportunity to review Anti-Friction Socks from Sof Sole. You can read all about my fabulous experience HERE. There were 99 entries in my recent giveaway. One winner was chose at random to receive a set of Sof Sole Anti-Friction Socks. Congratulations, Erin!!! 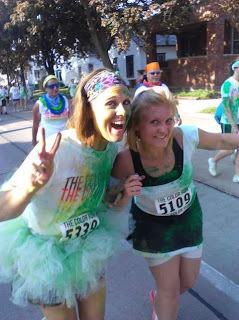 Please email me at ( runningdivamom at yahoo dot com ) with your name, email and mailing address. And, I will get you your prize! I was recently given the opportunity to spotlight Lego KIDSFEST, that is coming to Milwaukee, Wisconsin on June 15-17. 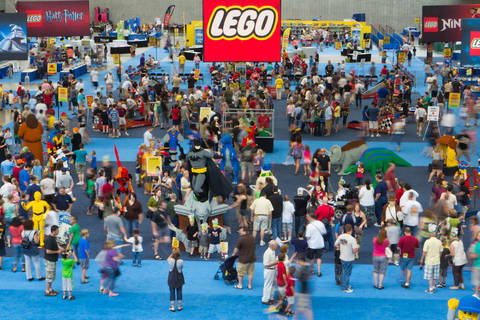 You can read all about Lego KIDSFEST HERE. 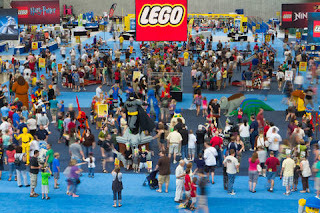 Please visit Lego KIDSFEST online HERE and see if they are stopping near you. There were 44 entries in my recent giveaway. One winner was chose at random to receive a pair of tickets to the Friday, June 15th event in Milwaukee, Wisconsin. Congratulations! 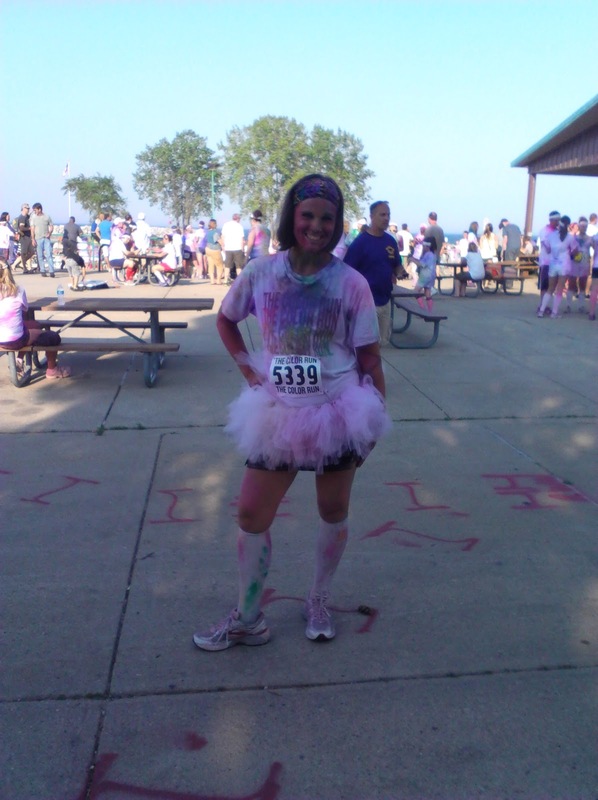 Please email me at ( runningdivamom at yahoo dot com ) with your name, email and mailing address. And, I will get you your prize! 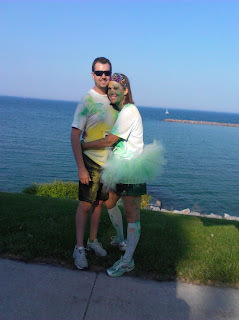 After The Color Run last weekend, we had all day on Sunday to explore Racine's lakefront. 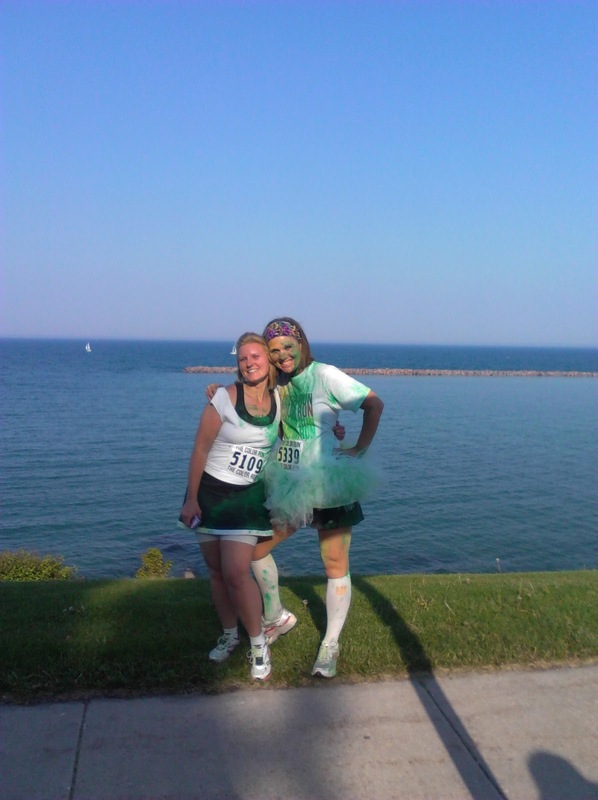 I had visited a triathlon even there several years ago, and knew that the Lake Michigan lakefront was awesome. I recalled a nice running path, sandy beach and great 'dream park' playground. You would swear you were at the ocean, during the warmer Wisconsin months. I had 10-12 miles planned for Sunday run. J had only run 6-7 miles with me prior. So, I wasn't sure what he would be up for. It was HOT and we both loaded up handheld water bottles. This was his first time carrying one. I don't think he regretted it one bit!! I read online that the Lake Michigan Pathway went 10 miles from north to south. We parked at North Beach and headed north. There were a few hills along the beach and then we headed into a nice residential area. We came to a dead end and were told by a resident that the path no longer went further north. So we turned around. We retraced our steps and then headed south, toward the site of the Color Run from the day prior. We passed a lot of boat slips and some nice beachside restaurants. We stopped to take a few pictures at an observatory look-out. It was a really nice way to explore the city and see how it all fit together. We stopped to fill up our water bottles and kept running. At one point, I noted that we would probably be finishing around nine to nine-and-a-half miles, by the time we returned to the car. He was excited to be done, I think. I reminded him that 9.5 miles was awesome, but it was not ten. 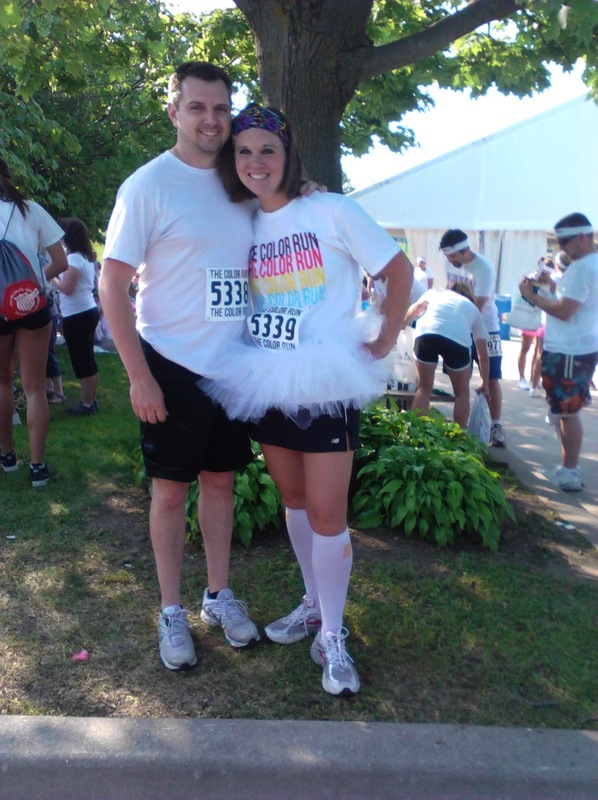 I told him that it would be quite a story to run the double digits along the Lakeshore with me … unplanned. So impressive. So, he agreed to keep going with me as we looped past the car and then back to the park. He continues to impress me with his motivation to do more. His ability to go out and run mile-after-mile with minimal training, just to be by my side and to further develop his love for his new hobby. His commitment to helping me stick to my plan. WHY you need to go out and run. But, it takes a partner to go out and do it WITH you. 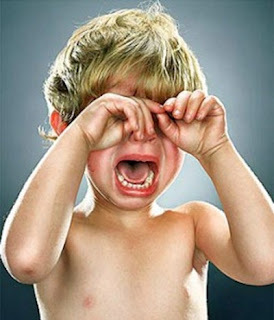 Time is going by so quickly ... Is next week really the first of June?!?!? I even haven't had a chance to update you on my Mother's Day. I hope that you had a good one. Last year, on Mother's Day, Little Dude, Little Diva and I finished the day with a fun run around our new neighborhood. The kids had a blast, we got some great pictures, and we got in some exercise. Trying to make it an annual tradition for us, I asked them if they'd like to participate again this year. They agreed. I loaded up the Marathon Mommy Minivan with a cooler of cold drinks, some snacks, The Little Red Car and Little Diva's scooter and helmet. We headed to our favorite park, where we parked the van. It was hot and there wasn't a cloud in the sky ... a perfect day. ﻿We ran a 2.5 route on a favorite path and returned to the park for some fun on the playground. We also had the opportunity to try out our new tennis rackets at the park's tennis court. After cleaning ourselves up, we got dressed up for the Mother's Day festivities. Someday, they are going to hate me for dressing them alike. But, I couldn't resist. They looked too darn cute. 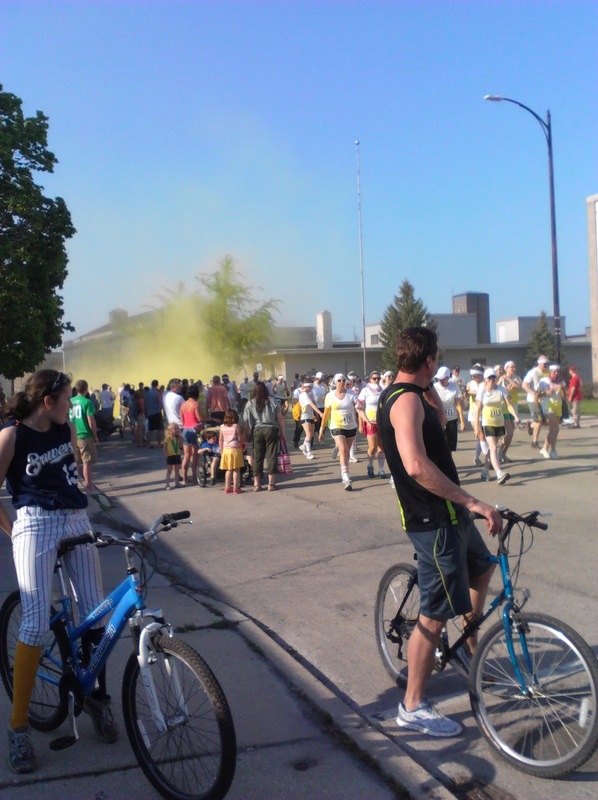 On Saturday evening, I was lucky enough to run The Color Run (HERE) in Racine, Wisconsin. 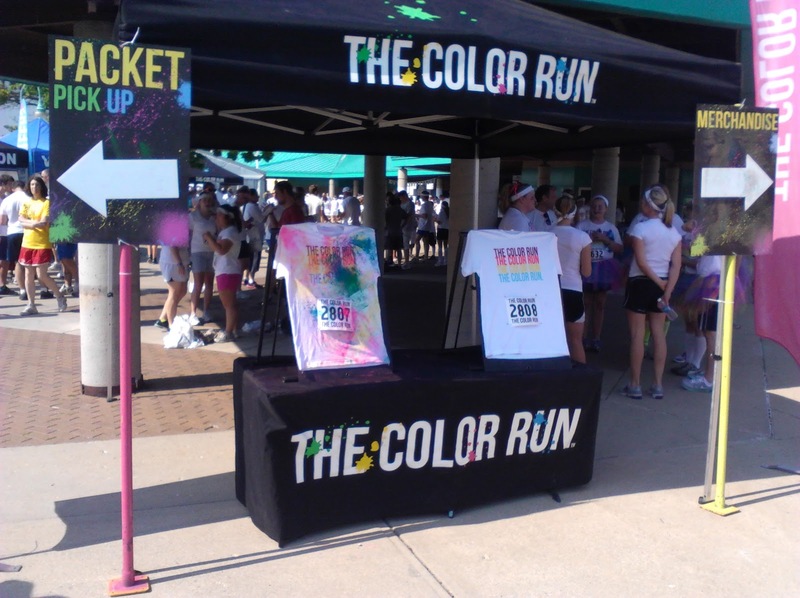 With so many big cities on the Color Run Map, it was a sweet surprise that one of the events was scheduled in the city offshore of Lake Michigan; in between Milwaukee and Chicago. The race was scheduled for an unusual 5:00 PM start. Packet pick up went until the start of the race. I was scheduled to coach a practice 10K race at 9 AM on Saturday morning. So, I ran two hours in the heat with them, drove home to get my things, packed up the car, and headed down to Racine in my sweaty running gear (nothing out of the ordinary for me!). When we got to packet pick up, things were kind of chaotic and the line for packet pick up (pre-registration) seemed really long. But, it surpringly moved quickly. While, in line, I did some texting and phone calls with Kayla from Midwestern Musings (HERE). She had won a free race entry from RDM and we were finally going to meet up after communicating on blogs and Facebook for close to two years. There were many versions of white shirts everywhere. People wore tanks, tees, cut off tees, and there were many fun costumes. I was one of MANY sporting white tutus. Your goody bag came with the cute t-shirt that I decided to sport during the race. 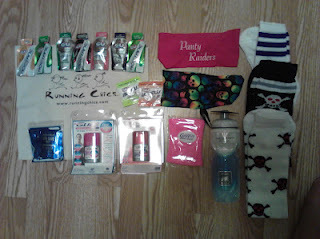 The goody bag also came with a white sweatband, tatto and additional packet of "color" to throw at the after party. 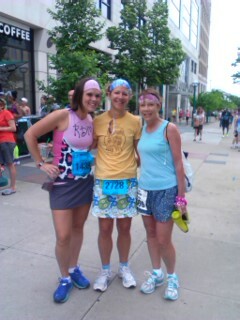 Kayla, J and I ended up posing for a few quick pictures, had a few runs to the parking ramp to get loot, drop off goody bags and finally we were off to the start line. We followed the sea of white t-shirts to the ever growing startline. I couldn't believe the number of people that were participating. We were placed next too a loud speaker ... and it was LOUD! They were playing lots of pop music and upbeat tunes. It was like a little pre-race dance party. We were amazed at the number of women participating. Very similar to the Disney Princess Half Marathon, I thought!! There were also a lot of families, and non-runners participating. 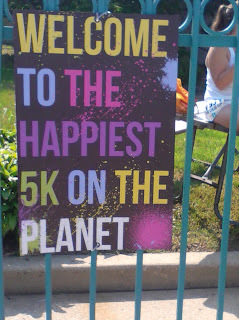 It was great to see all ages, shapes, sizes, and non-runners participating. There was not a clock, the race is not timed, and this is the first race ever where I didn't even wear a watch. 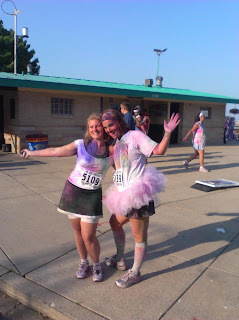 It was just about being outside, being active and having fun ... colorful fun! We ended off starting in several waves, which we didn't know about. 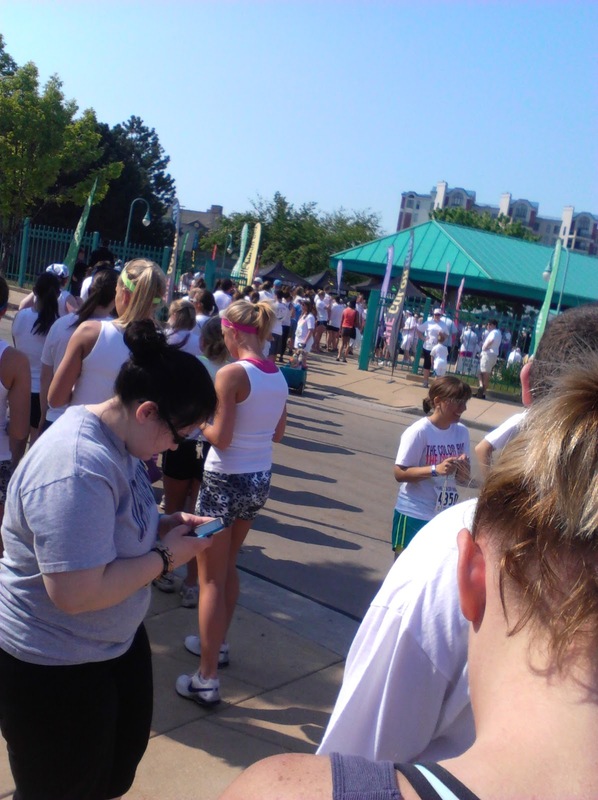 The herd of white tees kept starting and stopping. We started in about the fifth wave, and there were still several behind us. We wandered around through downtown, and then through residential neighborhoods and then were to finish along the lake. There were LOTS of walkers walking side-by-side. We tried to "jog" around them, but knew were definitely not going to be running today. It was kind of a cluster of people heading towards adults and children, wearing latex gloves and face masks. 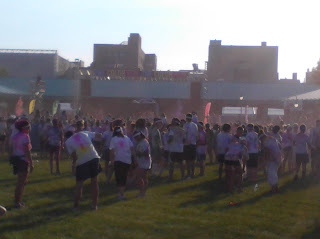 The volunteers were covered head to toe in caked, colored cornstarch. 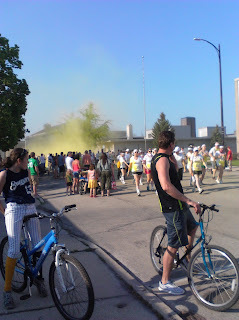 You had to physically run up to the volunteers as they tossed handfuls on you, and then could blend it around yourself. J's contacts were bugging him terribly, so after the first kilometer, he opted to swing around on the outside, and meet up with us after the color station. I still made sure he got "colored"!! 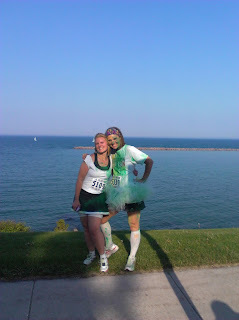 Kayla commented how we looked like green and gold Packers fans! There was a water station somewhere along this part of the course. Again, you had to physically stand there and wait for cups to be filled. Annoying in a typicaly race - yes. But, not annoying for this race experience. We looped around to Lake Michigan and stopped to pose some pictures along the lakeshore. Lots of people were stopped (again, reminding me of a fun Disney race). This was just about fun. My favorite color of all (of course!). All the ladies were giddy to run through a cloud of pink. It was fun smearing my favorite color all over my fluffy tutu and my face. Sadly, it ended up being the hardest color to get off my face, scalp, arms and chest after the race! They were playing Purple Rain, as we got covered in the purple goodness at the last station. We headed to the finish line. Again, no clock (expected). But the sea of people standing at the "finish line" was crazy. They were just standing there mingling. The announcer was trying to instruct them to move, but they weren't. It was so hot and humid and everyone was looking for water. There were huge crowds around the one water table that we found. 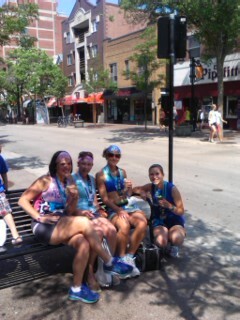 We grabbed some water, cooled down, and posed for some post-race pics. I saw someone else post online that The Color Run is a once in a lifetime experience ... not a race. And, I would definitely agree. It's one of those things that you need to experience for yourself. At one point, we said that it should be called The Color Walk instead. There were very few people actually running or even jogging the event. At about $50, I would personally prefer to race a half marathon. But, I do think that everyone should experience this once. It's a great opportunity to remind ourselves how much fun organized events can be. Some of us get so serious and motivated about endurance, speed and times. And, it offers others the opportunity to participate and get their friends and families active alongside them. I would have to agree that this IS The Happiest 5K on the planet. 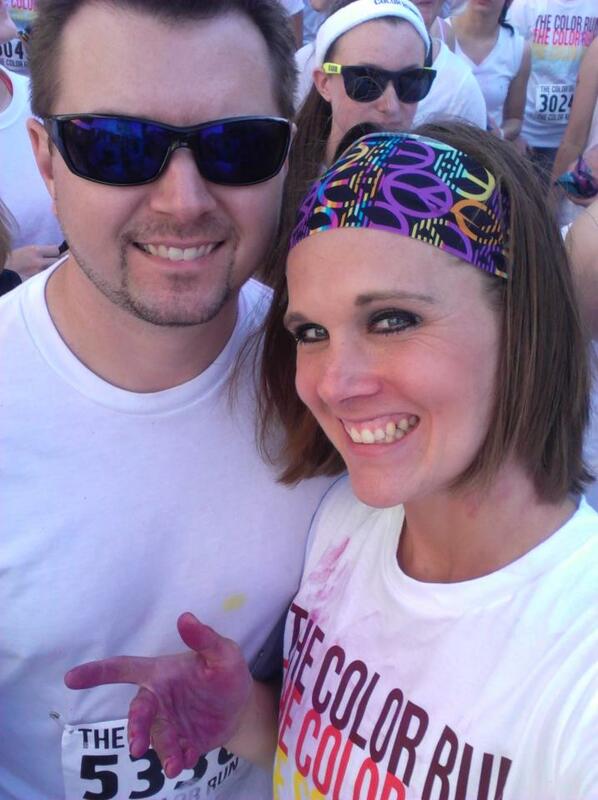 J and I are very thankful to The Color Run for having given us the opportunity check it out. We watched over the post-race party, where sweaty participants threw extra bags of color and clouds of smoke hovered overhead. Kind of magical. But, we had had enough at that point, and just watched from afar. We did stand in line FOREVER to get an alcoholic beverage. The food line was twice as long. I really enjoyed my Mike's Harder Black Cherry Lemonade, as we listened to a fantastic coverband, Hairball. The band was hilarious and very, very entertaining. 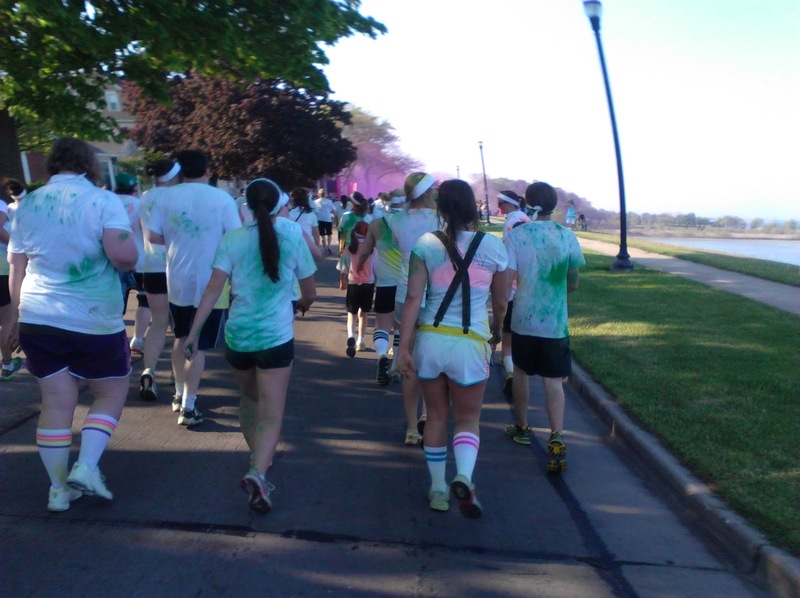 The Color Runis coming near you!